Update, June 16: OH MY GOD, THEY JUST SENT ME ANOTHER CASE. HELP ME!!! Overpaying for wine: we’ve all done it. You know what else we’ve all done? Picked a bottle out of desperation, noticing it was on sale, because it had a funny label, because the clerk told you to, or because you were sick of trying to figure out which one to get. Now, here’s your chance to overpay for a bottle that someone else is going to tell you to get, for a good cause! This year, I have again chosen to train with and fundraise for Team To End AIDS (T2), the charity training program for the AIDS Foundation of Chicago. I’m training this summer with T2 to complete the Whirlpool Ironman 70.3 Steelhead race, in Benton Harbor, MI on Sunday, 19 Aug 2012. This race consists of a 1.2 mile swim in Lake Michigan — a swim that is so rough it has actually been canceled in two out of the past four Steelhead races (and I really hope it doesn’t get canceled this year, because honestly the swim is the only part I’m really good at) — followed by a 56 mile bike ride, finishing up with a 13.1 mile half marathon run. All in all, it’s 70.3 miles. When was the last time you woke up on the weekend and said, “Hey, self, you know what I really want to do? Go take eight hours and self-propel three different ways for over 70 miles, with no rest breaks?” In August, when it’s like 90 degrees with a billion percent humidity? And you know I’m going to forget the sunscreen! This race is really super hard…but it’s still easier than living with HIV/AIDS. Which is why I’m doing it. But what does that have to do with wine, you ask? Well, I like wine, but I don’t know a lot about it. When I go to the store, I usually wind up buying whatever has an appealing description on the little index card taped to the shelf, what the clerk tells me to buy, the one that has a funny label, or if all that fails, whichever one is on sale. So I decided a while ago to join a wine club, so someone who actually knows what the heck they are doing would do all the shopping for me, and then one day there would be a box of wine at my door, and all the heavy lifting would be done for me, except for the literal heavy lifting. Except, as it turns out, I cannot be trusted with a wine club any more than I can be trusted with the BMG Music Club, as I never remember to tell them “please skip next shipment” in time, and so here I am with all this wine I can’t possibly drink because, oh yeah, with all this running and biking and swimming and whatnot, getting ready for my crazypants 70.3 race, I just don’t have the time to sit down and kill a bottle of syrah like I used to. Or, in the case of my current personal wine inventory, courtesy of the Virgin Wine Explorers Club, 22 bottles. 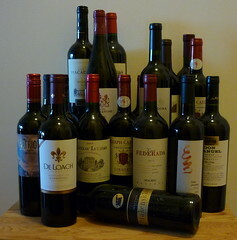 I have all these bottles of wine, and they need to find new homes. Homes where they can be loved, or at least drunk. Homes … elsewhere, not in my home. Because if I don’t have time to drink wine, I sure don’t have time to dust the dang bottles. So, if you would like to adopt a bottle, take it home, hug it and squeeze it and name it George, or just drink it all down, here’s what to do: Go to my Team To End AIDS fundraising page, and make a donation of $35 or more. You can come by to pick up from my home in the South Loop, or I can deliver it to you at work in the Loop or to your home in Chicago or nearby. If you’re in Central IL and don’t mind a delay, we can work something out. (Absence makes the wine grow deliciouser, or so I hear.) Varietals I have are Bordeaux, Syrah, Merlot, Zinfandel, Pinotage, Malbec … and other things of the red variety. They’re all delicious, or at least somebody at Virgin Wines thinks so. And, you know, it’s scientifically proven that we enjoy wine more when it’s expensive — so, maximize your enjoyment and donate today! The bigger your donation, the better the wine! IT’S SCIENCE! And also tax-deductible! #1 | Written by Divesh on 14 November 2015. #2 | Written by http://www.maysvillepresbyterian.com/ on 4 June 2016. #3 | Written by http://www.findingthefamily.com/ on 21 June 2016. LÃ je m’acharne un peu mÃªme si la prÃ©sentation n’est pas hyper pratique, car la texture et la couleur du blush sont vraiment superbes.Je ne sais pas comment la gamme va Ã©voluer, leur fond de teint est maintenant disponible en flacon pompe classique en plus du stylo emblÃ©matique de la marque. #4 | Written by http://pilulesenligne.men/ on 9 August 2016.